With voting continuing in the St. Louis Cardinals 2014 Hall of Fame class, it’s the perfect time to take a look at one of the nominees: Ted Simmons. 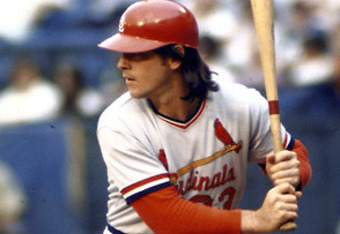 He was a Cardinal from 1968 to 1980, making his major league debut at age 19. He was a six-time All-Star in his Cardinals days and started at catcher for the National League in 1978 — which you can see a clip of below. In 1975, Simmons set the National League record for hits by a catcher with 188. He posted six seasons of 20 or more home runs and 10 consecutive seasons from 1971-80 with 75 or more RBI. His 172 home runs rank ninth and 929 RBI are seventh all-time in Cardinals franchise history. Simmons, the antique collector, the museum trustee, is also a .300-hitting catcher for the St. Louis Cardinals, and he looks the part: 6 feet, 200 pounds, hooded blue eyes peering out from strands of unruly black hair, an almost truculent mien, the sort of try-me posture that supposedly sets successful professional athletes apart from the run of humankind. But earlier, in the clubhouse, he had been talking not of fastballs, high and tight, but about the courage of Thomas More. “Now that’s what I call sticking with your convictions, no matter what the consequences,” Simmons had said of More’s fatal stand against the wishes of Henry VIII. That feature appeared about a month before that year’s All-Star Game on July 11, in which Simmons started over the injured Johnny Bench. Here’s a clip from that game and, really, it’s fantastic in so many ways. The announcers are Keith Jackson, Don Drysdale and Howard Cosell, plus Bob Uecker as a dugout reporter. Other players in the game include Fred Lynn — who’s at the plate when Simmons throws out Richie Zisk as he tries to steal second — Jim Palmer, Steve Garvey, Greg Luzinkski. Matt Keough, Carlton Fisk and Dwight Evans. Jackson reads a telegram that Bench sent. Cosell calls Simmonds “maybe the most under-publicized exceptional hitter in baseball.” Take a look at Simmons’ contributions in the game and enjoy. The National League won the game, 7-3, with Bruce Sutter (then a Cub) the winning pitcher. The full boxscore is here. Thanks to Michael, who once again provided an amazing video clip. This entry was posted in General Cardinals and tagged 1978, All-Star Game, Ted Simmons by Christine Coleman. Bookmark the permalink.